A graphical representation of the pear-shaped nucleus of an exotic atom. The shape of the nucleus could give clues to why the universe contains more matter than antimatter. 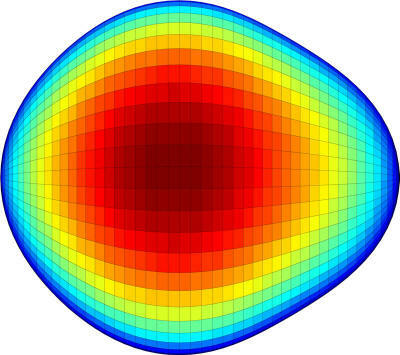 of the pear-shaped nucleus of an exotic atom. The shape of the nucleus could give clues to why the universe contains more matter than antimatter. Image credit: Liam Gaffney and Peter Butler, University of LiverpoolANN ARBOR - An international team of physicists has found the first direct evidence of pear shaped nuclei in exotic atoms. The findings could advance the search for a new fundamental force in nature that could explain why the Big Bang created more matter than antimatter - a pivotal imbalance in the history of everything. "If equal amounts of matter and antimatter were created at the Big Bang, everything would have annihilated, and there would be no galaxies, stars, planets or people," said Tim Chupp, a University of Michigan professor of physics and biomedical engineering and co-author of a paper on the work published in the May 9 issue of Nature. Antimatter particles have the same mass but opposite charge from their matter counterparts. When they find each other, matter and antimatter particles mutually destruct or annihilate. What caused the matter/antimatter imbalance is one of physics' great mysteries. It's not predicted by the Standard Model - the overarching theory that describes the laws of nature and the nature of matter. The electromagnetic interaction gives rise to forces on electrically charged bodies. The strong and weak forces operate in the cores of atoms, binding together neutrons and protons or causing those particles to decay. Physicists have been searching for signs of a new force or interaction that might explain the matter-antimatter discrepancy. The evidence of its existence would be revealed by measuring how the axis of nuclei of the radioactive elements radon and radium line up with the spin. The researchers confirmed that the cores of these atoms are shaped like pears, rather than the more typical spherical orange or elliptical watermelon profiles. The pear shape makes the effects of the new interaction much stronger and easier to detect. "The new interaction, whose effects we are studying does two things," Chupp said. "It produces the matter/antimatter asymmetry in the early universe and it aligns the direction of the spin and the charge axis in these pear-shaped nuclei." To determine the shape of the nuclei, the researchers produced beams of exotic - short-lived - radium and radon atoms at CERN's Isotope Separator facility ISOLDE. The atom beams were accelerated and smashed into targets of nickel, cadmium and tin, but due to the repulsive force between the positively charged nuclei, nuclear reactions were not possible. Instead, the nuclei were excited to higher energy levels, producing gamma rays that flew out in a specific pattern that revealed the pear shape of the nucleus. The paper is titled "Studies of nuclear pear-shapes using accelerated radioactive beams." I have received a number of questions about this above work that will be addressed here. Since I am pursuing the EDM experiments, my answers will emphasize this aspect of the impact of the research. How is the finding of a pear-shaped nucleus likely to affect nuclear physics research? Will it have any influence on our understanding of things like nuclear fusion? This work does not address fusion in the sense that it is a possible future energy source. As for nuclear physics research, we will continue to use this technique to study radon and radium atoms at ISOLDE as well as making use of other techniques at other labs. Perhaps the most significant effect on nuclear-physics research is that this provides increased confidence on the prospects of EDM experiments and their impact. What dictated your choice of radium and radon? These are two systems that are both accessible to EDM experiment for different reasons. Radon is a noble gas like helium or neon and thus has special features that allow a sensitive measurement. Radium has many attractive features and it can be trapped by lasers for an EDM measurement. From the nuclear-physics perspective, these are nuclei that were predicted to have strong pear-shaped effects. Why hasn't the shape of nuclei been studied in such detail before? Studies of the shapes of nuclei have been going on for a long time in particular for spherical and oval (rugby-ball or watermelon) shapes. The pear-shaped nuclei are not stable, that is they undergo radioactive decay to more symmetric shapes, so special technology is required to produce and accelerate these. This was developed at CERN by the REX-ISOLDE program. The ability to make the measurements of the pattern of gamma rays from the excited nuclei is a feature of the MINIBALL detector developed by a large team. The analysis of the data in terms of the nuclear shapes is also quite specialized with the greatest contributions coming from the University of Liverpool. What role does the EDM play in a nucleus being pear-shaped? How is its study likely to lead to the finding of new physics phenomena? The nuclear pear shape is a consequence of nuclear forces, while the EDM would arise due to much weaker, undiscovered forces. BUT the pear shape will make the effects of these undiscovered forces much stronger and easier to detect. Could you explain the role of the strong nuclear force and the weak force in the octupole deformation of nuclei? It is the strong-nuclear force that determines how the neutrons and protons move within the nucleus. This nuclear force on neutrons and protons has the important effect that it is not completely central and thus pushes protons and neutrons into unusual places (gravity is a central force that depends on the distance between two objects centers). The weak force has very, well, weak effect on the shape or structure of nuclei.